Sorry I've been gone, been busy, lol! Good thing Richie kept it going! Thought I'd post a little Bats pic, chekkit out yo! Things've been hectic, prepping for the Con, our new Sketchbook, my next project, and of course fitting the family all in there somewhere, lol! However everything's going good. The Con looks to be real exciting this year! Lot of people I'm looking forward to seeing! 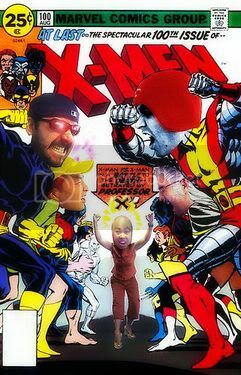 I'm hoping to get an X-treme Iron Chef battle up soon (Jim, wink, wink) We'll see how it goes. If it happens you all will be thoruoghly entertained! I know I will! Well, I'm super sleepy and would like to get to work somewhat earlier tomorrow, err I mean today! Today is opening day for Batman Begins; the picture above was the view from my hotel room near the Grauman's theater where the premiere was hosted early last week. That building was right across the street from the theater and appropriately dominated the landscape. My wife and I had just flown back Sunday night from a wedding in Fano, Italy for the Monday premiere (was at the wedding recepion til 1:30am, slept for 2 hours and then got up at 3:30 am to drive 4 hours to Rome for our 10:30 am flight to the States!) so I was worried that I would fall asleep during the flick since it wasn't going to start til 7pm which is 4am Central European time. Why the long trek to see the movie...well, I had a very small role in the flick. Now before you waste your time looking for me in the scenes with the Ninjas...what I contributed was at the very beginning. I did the illustrations that are part of the DC credit at the very beginning of the movie. I had seen animated logo before online when it was being created and it lasted some 12-13 seconds. I swear when I saw it on the bigscreen, it felt like 2. After that, I left the theater and went to bed. Just kidding. Anyway, I wanted to post my thoughts about Batman Begins before it officially opened. Deadlines got in the way, but better late than never, right? Couple caveats before I begin. I work for the parent company that produced Batman Begins. I also draw a comic book featuring Batman which may or may not be a positive factor in that I think comic book purists are the toughest a-hole critics to please. Count me in please. I wasn't a huge fan of the original 4 films. They started out really good and then got bigger and flashier and less interesting with each sequel. Just as a litmus test, my favorite 'superhero' comic book movies are Superman, Superman 2, the Rocketeer and Spider-Man 1...and the first Matrix which though technically not based on a comic book, just nails the spirit and intelligence we all look for in a superhero flick. And you we won't be with Batman Begins. Simply put, this is a GREAT movie; not just a great superhero movie, but a GREAT movie even if Christian Bale never donned the Cape and Cowl halfway through the flick; in other words, the origin pre-Batman was just as or more compelling than when he actually becomes the Dark Knight which is a real tribute to the director Chris Nolan (Memento, Insomnia) and screenwriter David Goyer (Blade). After 20 minutes of watching the movie, Denys Cowan who was sitting next to me, nudged me and said this is already better than all the other movies combined. And he was right. The first 2/3s of this world are loaded with intense imagery, great scripting and fantastic acting. We see aspects of the origin never really explored before. For one, we see more of the relationship between Thomas Wayne and Bruce that I had never seen in print. No longer just a cipher, a character introduced and killed to create sympathy and motivation to the protagonist, Thomas Wayne is quickly developed to be an extremely likable character. We know instantly who and what kind of person he is and that it's Bruce's need to be like his father and his guilt over his death which drives the man behind the mask, more so than the thirst for revenge against the criminal element. There were lines and scenes which made me go �"wow, give me more." And more they gave. Not so much in terms of the action, though there is plenty, I have to say that that kind of movie bores me to death. I know it's a function of my age as I have passed into a whole new demographic after hitting 40 but I love the scenes where we see and explore the character of Bruce Wayne and his various interpersonal relationships with his father, Alfred, and Lucius Fox more so than the end fight sequence along the streets of Gotham. Unfortunately, because we are so used to seeing action movies end in big set action sequences, we KNOW beforehand what we will be seeing and the net effect is a bit too point by point for me. Stopped the out of control train? Check. Big showdown with the main villain? Check. As visually fantastic as the action scenes were, I was more mesmerized when the ACTORS got to strut their stuff on the screen. Which takes me to the casting which for a glitch here and there was just SUPERB. Christain Bale is so talented he can convince you that he is both 17 or 30 years old on the screen and when he looks angry, it's just primal. Cillian Murphy just KILLS as the scarecrow. His crazy piercing eyes really makes this character much more formidable than the one you see in the comics. Micheal Caine's Alfred is just a treat to watch. He can tell he is reigning it in and he still manages to steal his scenes. Morgan Freeman as Lucius Fox is so damn charismatic and fatherly, it's crazy while Jim Gordon is more understatedly played by Gary Oldman who I wish we got to see more of. Probably plays a much bigger role in the sequel. Liam Neeson does an admirable role of playing the heavy--completely believable and smartly played. I was just glad to see him in a movie where he doesn't die in the first 15 minutes like in Kingdom of Heaven or Gangs of New York (and Star Wars tho he didn't die right away...but you knew it was coming!). My favorite shot in the movie is a sweeping shot as we pan across Gotham's skyline, passing Batman standing on a spire. It just looks so right, so real, and yet so eerie. Which is the feel the whole movie has. There are some CGI added bits to the downtown landscape but they really feel unnecessary in my humble opinion. The contrast of seeing this crazy masked figure juxtaposed on a real, very naturalistic looking cityscaping is really just breathtaking, much like it was seeing Spider-Man swinging through NYC or Christopher Reeves flying through a classic, modern looking Metropolis. Every environment looks and feels like they were there rather than in front of a green screen or in a movie lot. You can feel the biting cold of Tibet (shot in Iceland) and the dank, slippery rocks which line the Batcave. Overall, this is a sophisticated, intelligent movie which begs to be seen again and trust me, I haven't seen a movie twice in the theater in nearly a decade. And what I also really enjoyed was the humor in the movie. There are some droll asides from nearly all the principal characters including Batman and it's refreshing to see that even as Batman, Bruce Wayne is not entirely lost behind the mask. Director Chris Nolan really did something difficult here; Batman Begins is an entertaining, dazzling action movie which singlehandedly puts the Ooopmh back into the franchise yet manages to serve up a captivating, haunting tale of a man and his search to exorcise his personal demons. Afterwards, at the after party, I got to meet some of the people behind Batman Begins but I wanted to get back home since I had been on the road for nearly 2 weeks so we left at midnight and made the 2+hour drive back to San Diego in our rental car which was a fitting bookend to this crazy trip. Whew, whatta contest! I gotta say Karl impressed the hell out of me with his entry. If he wins he definitely deserves to. This is what this contest is all about! Karl brought a truly unique vision to the contest, and most likely has affected the way all us Iron Gelato's will approach future contests! I met Karl at Wiz LA, he's a great guy. I personally have followed his work for quite some time. I felt it was time to introduce his work here to you guys who may not of yet caught on. We'll leave the voting open till tomorrow noontime pst. But I just wanted to thank Karl once again for a great contest! Hopefully this is just the begining of some good battles! Here is our own Ale Garza's entry! If you like this piece please vote under this post! Here is our challenger's entry! A truly unique piece by a very unique artist! If you'd like to vote for Karl please vote under this post! Iron Gelatometti Battle! Ale Garza vs Karl Kerschl! Today's challenge is sure to come down to the wire! In a sense it is a battle where the dark meets the light! Iron Gelato artist Ale Garza currently working the Bat titles, faces off against our challenger, Karl Kerschl who most recently is residing in Metropolis! The rules remain the same. You the fans will choose today's subject matter. Today's eighth poster will be the deciding post. As always keep the subject to a single character, with an all ages guideline. Afterwards it will be your votes that will decide the winner! The contest will begin at 3:00, and will conclude at 4:00! Let the fun begin! Iron Gelatomettista Challenger: KARL KERSCHL! Today's challenger is none other than current Superman artist, Karl Kerschl! Known previously for his work on Majestic, Karl is quickly becoming recognized as one of today's top talents! With an art style that is truly unique, and full of life it is a sure bet that he will give our Iron Gelato's a run for their money! Make sure to tune in around 3:00 pst to be a part of the action, as you the fans will decide what our subject of the hour will be! For closer examples of Karl's work click these links! Return of the Iron Chef's! It's been awhile since we've had a battle, but it appears as if we have one set up for tomorrow! Our challenger is currently a "super" artist, known in the past for his "majestic" linework! So there you have it make sure to tune in at 3 o'clock west coast time for all the good stuff! "grrrrr, I'm vigerously angry" PSHOO!PSHOO! I just got home from The Faint concert. They played at Soma down here, pretty damn cool! I saw this elderly fellow at Chili's before the show, and was taken by his shirt. Fantastic isn't it? Also as per someone's suggestion, if all else fails, Carlos and I will go at it early next week in an Iron Chef battle-rama! Should be fun! Aside from that must get to work, peace out yo! I was going through my pile of Batgirl crap tonight looking and recounting what I accomplished on my run. I gotta say, it was a blast! There's a big part of me that's going to miss drawing her. Going through my stuff I found a lot of preliminaries I forgot about. Came across this little piece. Which was just a doodle, a re-imagining for my own mind. Made her a little more tech-y, opened up her mask, played with the colors. Who knows, something like this might've been fun. Either way it was interesting coming across it. I'm currently trying to recruit some big name talent for future Iron Chef battles. And it's almost definite we will be seeing the man himself partake ;) So keep your eyes peeled for that one! So I'm thinking I'd like to get this place jumping again. I know everyone's been busy but I'm going to make a serious attempt to once again attempt to get something of interest up each day. First off I'm going to get the Iron Chef challenges going again. I'd like to get at least a couple more before the SD Con so we'll have even more art to donate. Hopefully if his schedule allows it we'll get Jim to battle. Also Look for more Canyon, hopefully one this weekend. Also in preparation for our PH4 2k5 sketchbook, I'll be posting up a few more pieces of stuff that'll be featured inside. As for me right now I've just been chugging away. Trying to get as much work done in preparation for my next ongoing project. It's a real exciting time for me, and really for everyone else on this site. We all our going to be having some fun stuff coming out soon. Anyways, like I said, let's get this party goin' again yo! "turn down that original cast recording!" PSHOO!PSHOO! I purposely shyed away from seeing any of the advance material for this movie cause I want to see it as a 'fan.' Trailers these days just give away too much and scripts are too readily available online. Everything I hear about this movie is that it is the best Batman movie yet so I'm on pins and needles. Will drop a review later and after party report if I'm still standing. Just arrived last night from Italy where some of our close friends just got married on the coast of the Adriatic. So it looks like I'm gettin a shot to fill in on one of my fav books being published. That's right kiddies looks as if i'll be drawin them Intimates guys. Gotta say I've been a huge fan of this book since it's release. Joe and Cammo created a very entertaining little ditty. I got some big shoes to fill, but I feel I'm up to the task, heh. This is just serving as a bridge between projects. A nice little breather. Here is a a look back at a pin-up I did of the characters a while back. "Can't have enough princess's" PSHOO!PSHOO!